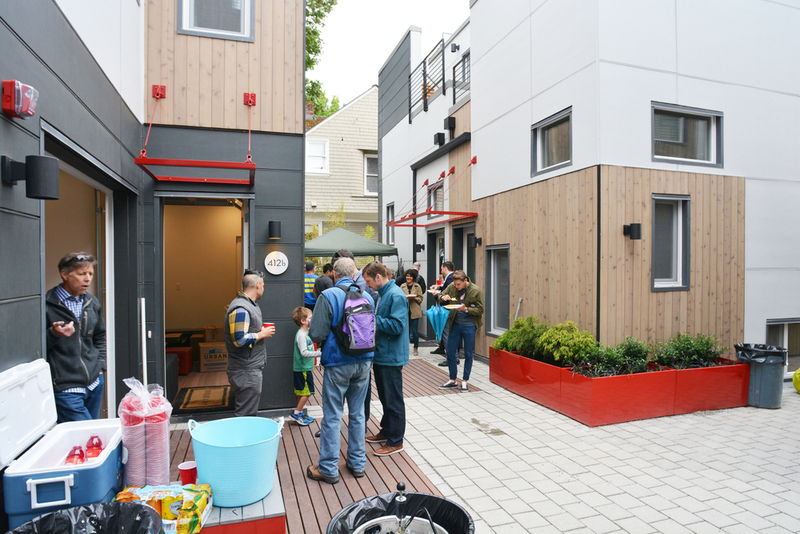 B9 architects and Cascade Built, along with a community of neighbors, friends and family, gathered to celebrate the completion of the SolHaus townhomes on Capitol Hill, codeveloped by b9 and Cascade Built. The party took advantage of the generous central courtyard and demonstrated the versatility of the project. Residents opened their doors and welcomed neighbors in to their units, each of which had been designed with unique characteristics. One feature that is shared by a majority of units, however, is a large insulated glass roll up garage door that fronts the central courtyard as a gesture towards community. One owner, who had only just begun to move in, was generous enough to allow the gathering to spill in to their unit, stepping among their boxed belongings and dodging the children that darted through the houses. The evening was terrific way to celebrate another great project!